You will find guides to the area. Richard, a keen sportsman, is always happy to give you tours (by car/cycle or even walking!) by separate negotiation, of this enchanting area famed for its natural beauty, hills, swimming in the River Orb and the wonderful wine such as St Chinian. There are over 30 top class interesting walks/cycle routes in the area to suit various abilities. 10 of these fantastic walks are within 10K SEE HERE + 2 car tours if you prefer. Wine tastings locally and visits to top restaurants can be arranged, at times to suit you and your tastes. For example Pezanas is a wonderful mediaeval town with a famous former Jewish quarter. It boasts 3 Michelin star restaurants alone. 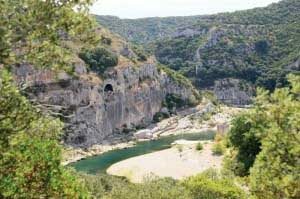 There are mountain bicycles to hire and kayaking down the rapids of the River Orb from Roquebrun just 5km away. French Markets? Are they not fabulous? I have 10 in different towns all 28 K or less from me. The closest is St Chinian on Thursday and Saturday just 12 K away and Lamalou-les-Bain 13 K away on Tuesday, Thursday and Saturdays. In the village you will find a restaurant 400 m away selling local wine at E2 a glass and oysters E1 each! In addition there is the usual boulangerie, a small grocery shop and a beautiful church. Truly you will not be bored! We escaped the coastal crowds in Roquebrun, a small village in the Haut Languedoc, close to the beautiful Minervois and the Cathar trails. Flowing below the village is the Orb, with weirs and protected pools (excellent for small kids), but also great swimming in fast-flowing waters. With canoe and pedalo hire above the weir, below the stunning bridge gateway to the village, this is a great place for families to cool off. The beaches are relatively uncrowded with endless stretches of golden sand and are extremely child-friendly. None of the bustle and over-crowding of the shore-line in Provence. Here, you’ll find exactly what you’re looking for; all the excitement of a Mediterranean beach (water-sports, hot sunshine, warm and clear sea) without the crowds. VALRAS PLAGE: One of the closest beaches to the villa? It’s about 35 min in the car depending on traffic. We recommend that you go to the beach midway through the afternoon (about 3pm). In this way, the sun will still be at its highest, you’ll pass all the traffic coming away from the beach and there will be plenty of places for your pitch on the sand. Stay for a cold beer or a coke or ice cream at the end of the afternoon and avoid the traffic jams on the way home. There’s everything going on here; cafés, bars and restaurants, beach games, amusements, water sports, street markets, beach shops etc. SERIGNAN PLAGE / VENDRES PLAGE: VIAS PLAGE / PORTIRAGNES. Not as busy as Valras Plage. Plenty of space to spread out and have some privacy. Great stretches of sand and a few of the essential amenities.